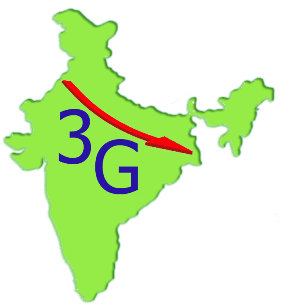 Indian users can now enjoy 3G data at reduced rates | NewbieTechTips! Good NEWS for India 3G data lovers, telecom companies are on the way to reduce the 3G data prices in many circles. Reliance 3G took the lead and announced a significant cut in its 3G data plans. The new 3G data plans, which the as the company claims "2G ke rates me 3G", are available for prepaid and postpaid Reliance customers. Reliance is offering 3G data for 1GB at Rs. 123, 2GB at Rs. 246 and 4GB at Rs. 492. Although these data plans are applicable only for use in mobile phones and cannot be used with data card. RCom says, "the aggressive and affordable pricing is likely to push adoption of 3G network in the country, “ensuring greater traction from mid- to high-level data users, and resulting in significant data usage and revenue growth across customer segments”. Following this on the occasion of Indian Independence day telecom giant BSNL also announced new uniform 2G/3G data plans. In view of rationalization of GPRS/Data tariff BSNL killed exixting 2G and 3G data plans and introduced 4 new 2G/3G Uniform DATA STVs with effect from 15-08-2013. MRP of the Data STV with S.Tax in Rs. These new prepaid 3G prices is applicable for both mobile and data card users. These new new low prices will likely to trigger price slashes by other cellular operators also to stay in competition. So it’s a good NEWS for all speed lovers in India. Although it might be a bad news for a few who were still enjoying 2G data plans because as compared to 2G data plans these new BSNL unified plans are bit costly.